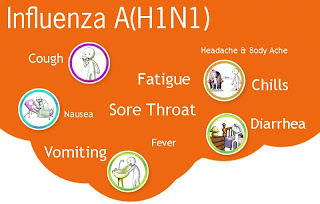 The information covering H1N1 precautions and preparedness will come in a series of posts. There isn't a snowball's chance in heck that I could cover all the material in just one shot... well, I could, if you like reading a novel about the Novel H1N1. But at least, I will be able to guide you step by step on how to start paddling though the loads of manure out there on the subject. So together, we will handle the threat of the H1N1 like any normal and rational people of the 21st century: we will wage war on it. We're talking full-on military strategy! Bring on the missiles of disinfectant and the trenches of hand sanitizer: nothing is getting through our defenses. So bring on the rain, you piggy fiend from the underworld! In the words of the great military strategist, Sun Tzu (The Art of War), "It is a matter of life and death, a road either to safety or to ruin. Hence, it is a subject of inquiry which can on no account be neglected." 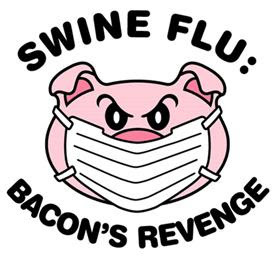 The last post I wrote laid the foundation for understanding the nature of the bacon beast and what we are up against, focusing on debunking the myths surrounding our viral pork product. One of the first steps in engaging in the art of war is lay plans based on the characteristics of your enemy, while eliminating any misconstrued beliefs of their weakness or false strength. In this post, I will attempt to finish that premise, by describing how to recognize the bacon bandit. 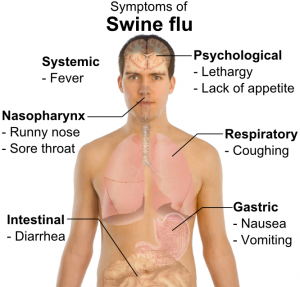 So, to start off, I will explain what the signs and symptoms are of the H1N1 as compared to the regular seasonal flu. The New York Health department gives a nice list of the similarities and differences between the two viruses. I will begin with the general influenza symptoms: these symptoms are evident in both the seasonal flu and the H1N1, which include fever, cough, runny nose, sore throat, body aches, headache, chills and fatigue. Or maybe, the internet dating sites just didn't work out for it, so it is seeking revenge on all the youthful people that spurned it. As in, some dumb internet date says to it, "You're a lot fatter than your picture." 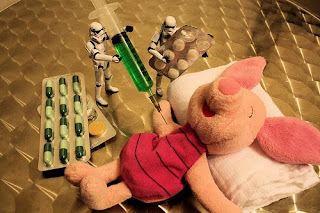 I mean really, the swine flu has feelings too. We don't know. We may never know. Maybe we'll get lucky and the swine flu will go on TV, in front of a dirty green cloth painted with squirlies, to make an announcement of why it launched an attack on young people across the world as some sort of symbolic Jihad, while all the true viruses shake their heads at its blatant stupidity and rash behavior. But at any rate, we still need to be prepared to counter the viral onslaught this coming flu season. Which leads us to the next step in the art of war, preparing defenses against and preventing the advancement of your enemy's forces. 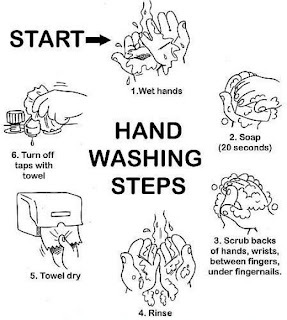 Second, we can remember that perfect hygiene is the best means of preventing the transmission of the disease. 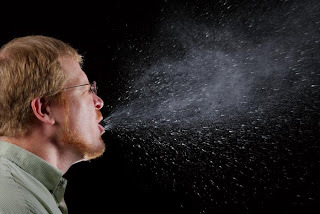 Covering one's mouth and nose with a tissue when coughing or sneezing has been shown by researchers to greatly reduce the spread of the H1N1. Holy pork rinds, Batman! Can you believe size of that spit spray in the above picture?! It's like sputnik exploded in his mouth, or like he swallowed an angry fire hydrant! Or maybe, he wanted to do an impression of Old Faithful? 2. The virus is transferred to an object or surface from an infected person's hands. Then an unsuspecting victim, minding their own business all healthy and happy, touches one of the infected surfaces unknowing of the viral-loaded presents that lay thereon, and then touches his or her eyes, nose, or mouth... Wham! They are inoculated with H1N1 and the cycle of transmission continues. In addition to washing with soap and water, it is also a good idea to carry hand sanitizer gel with you. Hand sanitizers are a fast and effective way of eliminating germs from your hands and your children's hands when you are out and on the go. Ah, darn! Look at the time. I guess that is all I am going to have time to discuss today. 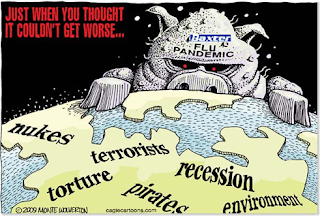 But my next post will give a deeper look into understanding where one can catch the H1N1 and how to prevent the monster pig from attaching itself to you and entering your homes. Later posts will discuss what to do in case the virus does manage to enter your household, what to do if you are infected yourself, how to take care of sick children, what to do in the event of a quarantine, and the things that you may need on hand in the event of these things do occur. Have a safe and fun pig-free day. Until next time, please try to keep yourself from ending up like this guy. 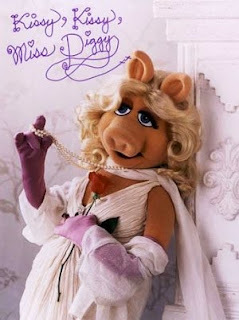 The caption read, "Kermit the frog dies of the Swine Flu. And we all know who gave it to him! Don't we?" Be afraid. Be very afraid. 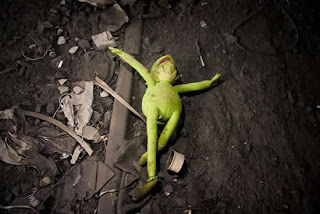 (Image of Kermit the frog dead from the Swine Flu taken from http://timwadesblog.com/tag/kermit-the-frog/).